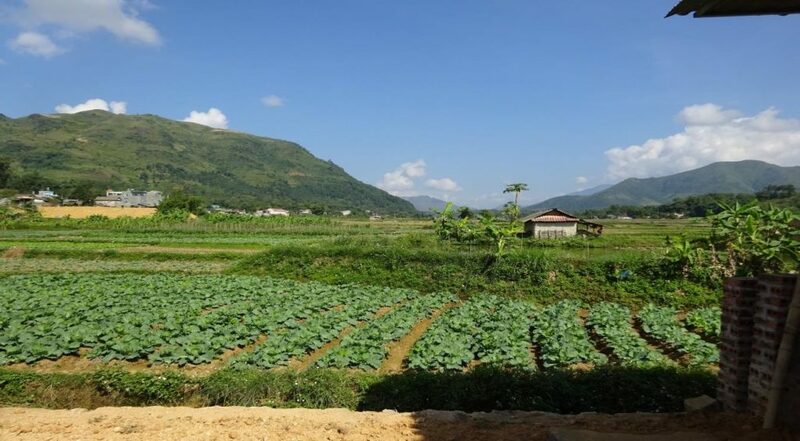 Thanks to The Crawford Fund in Tasmania, University of Tasmania (UTAS) student Jo Talbot travelled to the mountains of North-Western Vietnam for a research trip. The trip focused on researching beef-cattle production in upland cropping systems with the goal to increase production to improve the quality of life and build wealth for rural farmers. Traditionally, cattle in Vietnam are raised by farmers to be used as an asset that can be sold when the family needs money for weddings, education, illness or housing. Maintaining a large herd of cattle is difficult in these highland regions due to land size restrictions for the growing of crops to supply adequate nutrition. Farmers are supplied with a plot of land, relative to the number of children they have. Jo found that from their plot, farmers must produce enough food to feed their families, livestock and produce enough cash crop to make a living. The current crop-livestock systems are seen by the local government as being highly unsustainable, with current practices causing erosion and negatively impacting waterways. Jo’s research trip aimed to find ways to increase cattle production in highland farms to build wealth, improve livelihoods and empower female farmers. During her time in North-Western Vietnam, Jo conducted interviews with local farmers and built relationships with local government officials. She worked with them to identify the community’s needs, circumstances and what they hoped to gain from her research. Her research is connected to the ongoing project with ACIAR. “The farmers I met with varied from single mothers to families with three generations living together under one roof. I found that increasing cattle production was their best option to build wealth and move away from poverty”, said Jo. Jo’s research identified that while demand for beef was growing, a number of factors limited the farmers’ ability to increase production. Namely the difficulties with maintaining crop production and supplying markets with produce without the risk of spoilage. Access to refrigeration in remote parts of Vietnam is limited and often completely unavailable, making the transport of beef-products to markets outside of their local community impossible. She also noted that the relationship between the farmer and the market-families hasn’t traditionally been a strong recurring relationship. The market-family is purchasing to meet their supply demand, the farmer traditionally sells only when money is required. Jo explains that this system results in fluctuating trade partnerships between markets and farmers, making the recurrent purchase of beef-products unreliable. Jo’s research found that farmers need to move away from traditional time consuming free-grazing and into more intense feedlot and stall-feeding practices, to ensure continued supply and recurrent relationships with market-families. A shift towards more efficient farming practices will also free family members to work on cultivating crops for feed and market, therefore enabling farmers to increase their herd capacity. Reflecting on the impact of her research, Jo believes that adopting these new practices will allow farmers and their families more time to engage in off-farm work including selling their produce at market or assisting other farmers. Moving forward in this direction would also enable children to take time to attend school, ultimately resulting in increased wealth, empowerment and security for families. Jo’s trip to Vietnam is part of our efforts to support and encourage young Australians in study, careers and volunteering in international agricultural research, our International Agricultural Student Awards from Crawford Fund State Committees will be supporting 14 Australian tertiary students to gain international agricultural research experience and expertise.